As promised, here is a picture based on the toy version of Castaspella. Also posted here on my variants thread on the He-Man.org fan-art forum. First off, you will notice that I have changed her into another character. While the toy’s packaging depicts Castaspella very much like her cartoon appearance, (bouffant intact), the toy itself simply had the hair tied in a ponytail. Because of the significantly different hairstyle, coupled with the toy’s differing color scheme, I decided to make her into a new character. The name Sorciela is taken from an image I found online of international packaging for Castaspella–unless I’m mistaken, Sorciela is her French name. PROFILE: An extraordinarily capable magic-user, SORCIELA far exceeds the limits of most of her peers, but still requires focus and experience as a result of her youth. She specializes in hypnotism, but excels in this particular area to the detriment of her other magical capabilities. Sorciela can be impatient and frivolous, but her sense of compassion and fairness is true. 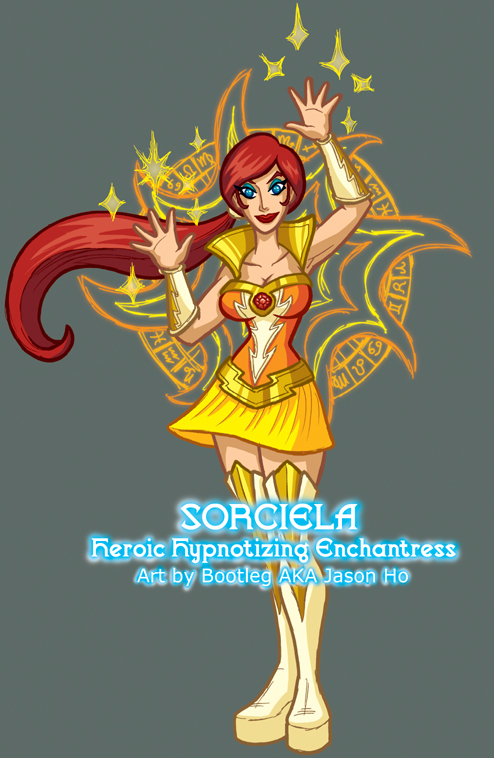 HISTORY: Sorciela is the younger sister of Castaspella, Mage-Queen of Mystacor. When Castaspella ascended to the throne, Sorciela was sent away to a hidden location. There were two motives behind this–first, so that Sorciela could continue her education in the use of magic, and second, so that the next in line for the throne would be protected in case any harm should ever fall upon Castaspella. With the Horde’s presence growing ever more oppressive and She-Ra’s departure to Eternia, Castaspella has summoned her sister back to Mystacor to aid in the defense of the country, and the planet. < Previous A Shocking Event: I have drawn a character from an 80′s cartoon. dang man, with you wolves, when i post the foxxy cartoon ladies, it’s like they’re walking past a construction site!